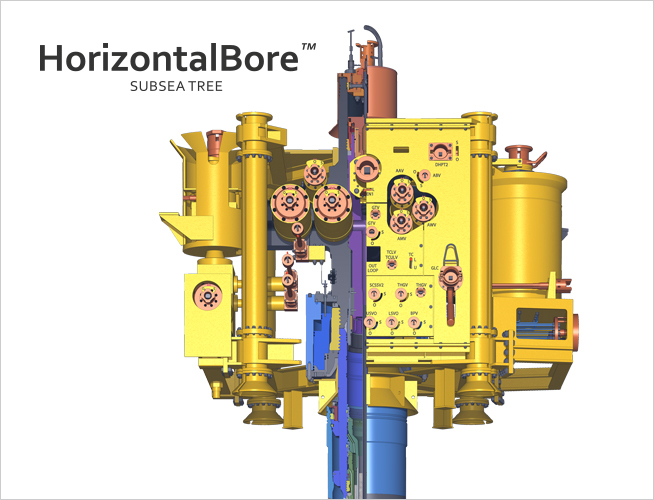 Dril-Quip’s HorizontalBore™ Subsea Tree offers a standard modular design allowing it the maximum flexibility to meet today’s demanding subsea applications. Horizontal trees are typically used on subsea wells that may require multiple workovers, wells that have complex downhole configurations, and wells that may require downhole submersible pumps. The Dril-Quip HorizontalBore™ tree accommodates the most downhole functions in the industry and can be configured to accommodate downhole ESP’s with minimal modification. Dril-Quip HorizontalBore™ trees can be equipped with direct hydraulic, electro-hydraulic or fiber-optic based multiplex control systems and accommodate a variety of optional, third party equipment. Vertical or horizontal flowline connections are available in either hydraulic or mechanical latching versions. The Dril-Quip HorizontalBore™ tree features a 14.5”drill-through bore, providing flexibility in drilling/completion operations and well design and can accommodate up to 7" production tubing sizes. The tree is fully qualified to API 17D 2nd Edition. The Dril-Quip HorizontalBore™ tree system that offers maximum flexibility in configuration and application (deep or shallow water) from a vertically integrated manufacturer offering an economic solution with faster deliveries. Contact Dril-Quip for more information.